Can you believe that summer is almost over? Fall is just around the corner and with that comes pumpkin lattes, yummy smells, pretty colors, comfy clothes, and back to school. 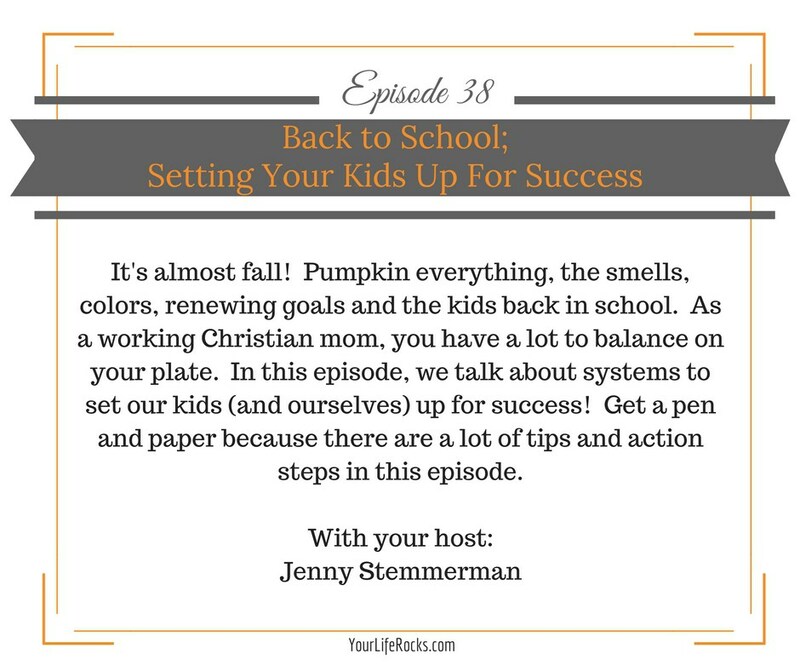 We all want to set our kids up for success right? A new school year is a blank slate for them to achieve new goals. Setting good, healthy habits from the beginning is key to laying the foundation for a successful year, and keep peace in your house in the process. Sanity is a gift and something you can have. Put a radio alarm in the kids rooms. This isn’t to necessary wake them up but to play Christian music at a low volume as they are waking up and getting ready in the morning. Play beat the clock in the morning. You assign times for each thing they have to do, but if they get it done faster and with quality work; then they get free time! During dinner time, play a game of Peak and Pit. Have each member of the family name the “Peak” of their day and the “Pit” of their day. You will avoid the “How was your day?” “I don’t know” conversation. Bed time can be stressful. Don’t let anger take over! Send the kids to get into bed and then pray, take a deep breath and remind yourself to cherish the moment. They are only little for a short time and we never know what the future may hold. Enjoy bed time! Fall is a great time of year for you to set new goals and finish the year strong! We are launching Life Balance by Your Life Rocks to help you reach goals in all areas of your life and move you closer to balance in your life. This monthly membership site is full of training to help you with time management, Sunday Success Planning, Daily priorities, and is all designed to help you reach the vision you create for your life in 90 days. Need help creating that vision? We can help with that too. This membership also includes your planning pages to keep you organized and on track. Life Balance is designed for the Christian Working Mom in mind. Life gets busy, but this system keeps God at the center of your day and keeps you moving toward your accomplishing your goals in all 8 categories of your life. Join our free Facebook group! We would love to share life with you! Click here for instant access!